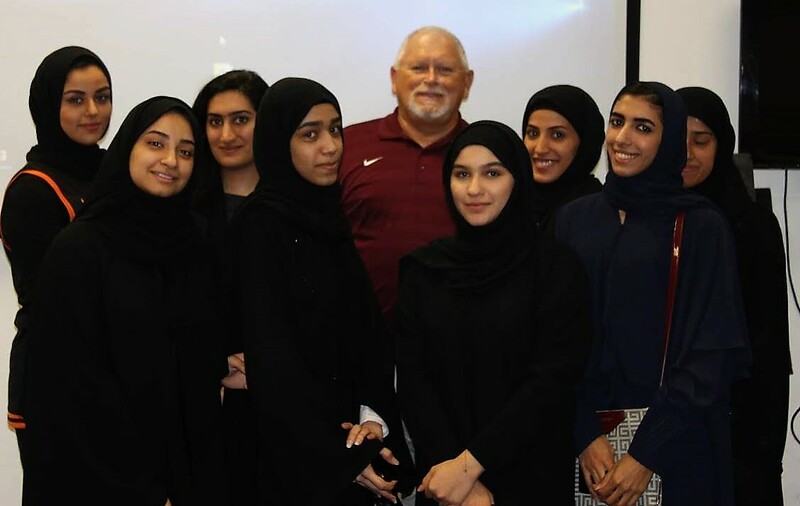 United States Sports Academy instructor Marty Floyd, second from left, with students in Bahrain. Floyd taught the Academy’s certificate program in disabled and adaptive sport for the Bahrain Sports Federation for Disabilities (BSFD). 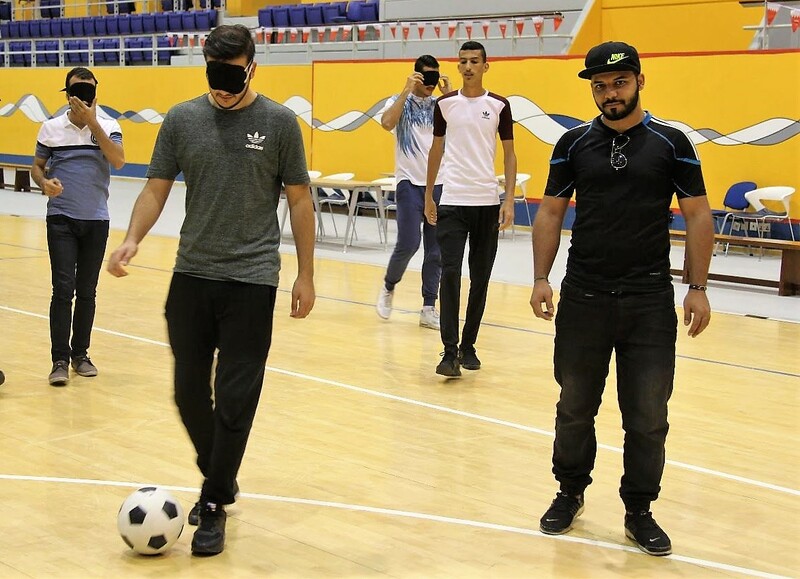 DAPHNE, Ala. – The United States Sports Academy is continuing its longstanding relationship with the Kingdom of Bahrain by teaching in a national program to help coaches there develop better skills in working with athletes with adaptive needs. Academy National Faculty member Marty Floyd recently traveled to the island nation in the Middle East for an extensive teaching stint for a certificate program in disabled and adaptive sport for the Bahrain Sports Federation for Disabilities (BSFD).  The Adaptive Sports program is a unique course of advanced study designed for coaches who have or want to have experience working with athletes with varying degrees of adaptive needs. The program has a two-pronged approach that includes working with competitive athletes and developing inclusive programs for recreational athletes. Floyd has more than 40 years of experience in the sport, education, training, leadership, instructional design and management fields. “Teaching in Bahrain has been a truly exciting and rewarding experience,” Floyd said. 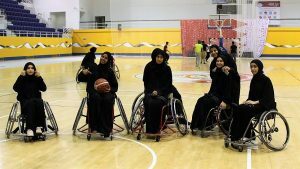 “Being a part of the Bahrain Training Project for Disability Specialists through the United States Sports Academy is the highlight of my 40-year career as an educator, coach, and administrator. 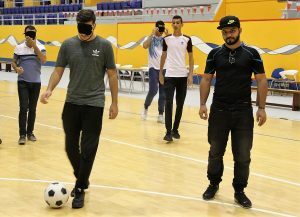 “The students embraced the coaching skills and disability sports with excitement, new shared visions, and a new outlook toward the disabled – from seeing the disability to seeing the ability. Students in Bahrain hone their adaptive soccer and wheelchair basketball skills during class taught by United States Sports Academy instructor Marty Floyd. The students are taking part in the Academy’s certificate program in disabled and adaptive sport for the Bahrain Sports Federation for Disabilities (BSFD). Floyd, who has worked in athletic and education administration since 1980, taught courses related to sports coaching methodology, adaptive athletics and sports, inclusive recreation services, and nutrition and ergonomic aids. “I found that students are the same, whether in the United States or Bahrain,” he said. “They want to learn, they want to succeed, and they want to become better at their craft. The program is notable because it marks the return of the Academy to Bahrain after a hiatus of several years. The Academy’s involvement in Bahrain goes back more than 40 years to the beginnings of the Academy’s international instruction, research and outreach programs. In 1977, the Academy worked with the Bahrain General Organization for Youth and Sports to develop a physical fitness test used to gauge the fitness of every school-aged child in that country, providing the first profile of youth fitness in Bahrain. A descendant of that test is still used today. For three years after, the Academy had full charge conduct of Bahrain’s national sports effort including sports medicine and human performance research laboratory. Since then, the Academy has conducted numerous programs in Bahrain focusing on physical education in schools, fitness, recreation, youth sports, the Bahrain National Olympic Committee, and fitness programs for police officers, among others. A resident of Gulf Shores, Ala., Floyd is a consultant for the South Alabama Research and Inservice Center at the University of South Alabama in Mobile. Floyd previously worked as an associate scout for the Chicago Cubs baseball organization and as a certified trainer for non-violent crisis prevention. He has served as a baseball and softball umpire at the youth and high school levels and has taught hitting, pitching and fielding. He has also worked as an instructor for high school and middle school volleyball camps. Floyd earned his bachelor’s and master’s degrees in special education from the University of South Alabama (USA), where he also earned a Superintendent/Principal Administrative Certification. For a video on the Academy’s adaptive sports program in Bahrain, go to https://youtu.be/HvgnelYHuSg. Since its founding nearly a half-century ago, the United States Sports Academy has leveraged its role and resources as a special mission sports university to make a global impact through quality sport instruction, research and service programs in 65 countries around the world. These contributions have varied in scope from the full-charge conduct of a nation’s entire national sport effort to individual coaching clinics, seminars, and symposia.